Nest Bedding is a popular mid-tier to high-end mattress manufacturer that offers “mattress-in-a-box” services. Perhaps what is most unique about Nest Bedding among online mattress retailers is that the brand offers a unique “brick or click” experience. Whereas many online mattress retailers only offer their mattresses for sale online, Nest Bedding developed a chain of California-based boutique mattress stores in tandem with their e-commerce presence. This allows many potential customers the choice between trying out a mattress at home (Nest Bedding offers a 100-night trial period similar to other online mattress retailers) or heading into a brick and mortar store to try a mattress. 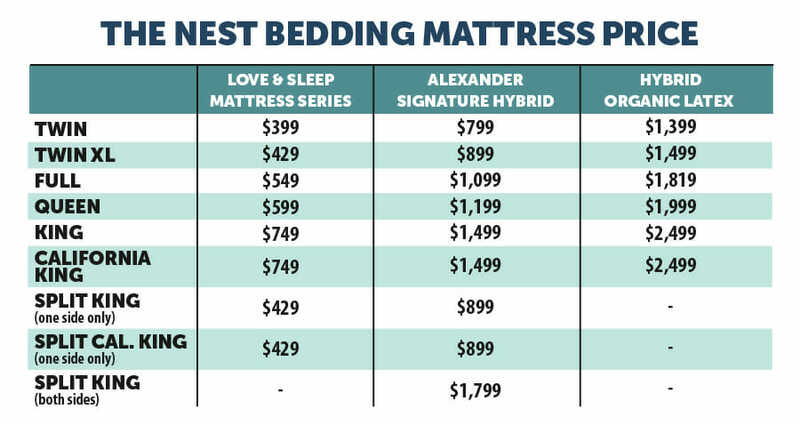 Besides the brick and mortar component of the Nest Bedding brand, another particularly unique aspect of their offerings is the breadth of price points and materials used. Many online mattress retailers focus on one type of mattress (memory foam, innerspring, or latex). Nest Bedding offers mattresses in all three major mattress material types: coil spring, memory foam, and latex. This also allows Nest Bedding to offer mattresses at a broader range of price points than most online mattress retailers. Ranging from $399 to $1099 (for twin mattress sizes), Nest is able to straddle low-end through high-end mattress price points. Additional qualities that many consumers love about Nest Bedding’s mattress options include a lifetime warranty, fast shipping, a range of firmness levels to choose from, and the fact that the mattresses are made in the U.S.A.
Tens of thousands of Nest Bedding customers have left verified reviews online, giving us a great lens through which to get the “low down” on Nest Bedding products. At OnlineMattressReview.com we’ve combed through thousands of reviews on almost all of the top mattress brands out there, and wanted to provide readers with a thorough review of Nest Bedding products. We can read through the marketing materials, go lay on a Nest Mattress of our own, or read other reviews, but to really see what makes Nest Bedding mattresses work for tens of thousands of happy customers, we’re going to present the most commonly shared reasons why current owners love their mattress. As most review locations for Nest Bedding products are on a 1-5 scale, we’re going to take scores of 4 or above to constitute “good” reviews. As a source of context, well over 90% of reviews for Nest Bedding rate their experience or the product with 5/5 stars. 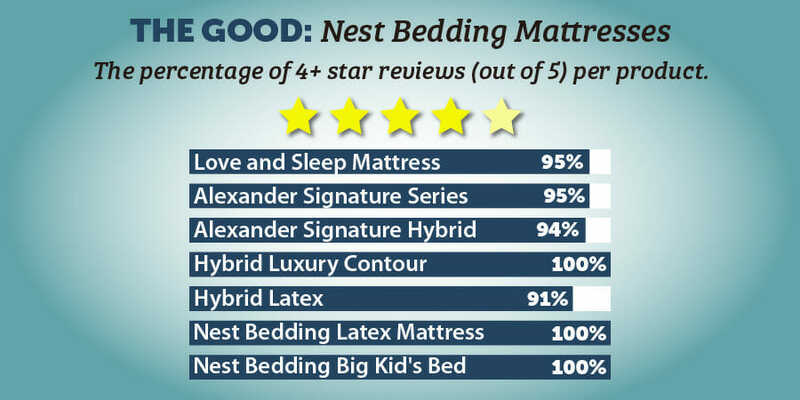 Below are the most commonly cited reasons for “good” reviews of Nest Bedding products. The ability to try out a mattress in-person in many cities before buying. Free sheets come with some orders. Easy swapping of one mattress for another facilitated by customer service. Wide range of price points, firmness levels, and mattress materials. Many choices! Competitive with products that cost 4x more. Organic option available for latex mattresses (no out-gassing or extra chemicals). Very well made Homebase mattress foundation. Many customers find the “free” sheets included with purchases are their favorite pair of sheets. Many sleepers love the thickness of Nest Bedding pillows. Curved pillow a unique offering loved by many. Great neck support in pillows. Latex mattresses good for large sleepers. “Cushiness” and firmness of memory foam mattresses great for side sleepers. A minuscule percentage of Nest Bedding product customers had at least a minor issue with their delivery, customer service, or product. Add to that that no one mattress brand is going to be a perfect “fit” for every consumer, and you’ve got a few common minor complaints about Nest Bedding’s products, service, or sleeping experience. Below we’ve detailed all common reviews rating some aspect of a Nest Bedding experience with 3 in 5 stars. For context — depending on the sleep product in question — between 0 and 3 percent of reviewers rated their experience with 3 in 5 stars. Some customers noted too much motion transfer in the Love and Sleep Mattress. Some customers selected the wrong firmness level, requiring swapping out of mattress. Some customers noted they felt that the Love and Sleep mattress sleeps hot. Some customers have noted sagging after just a few years. Some customers found firm Alexander Signature mattresses much too firm for side sleepers. Some customers noted this mattress slept hotter than expected. Some customers have noted poor quality control, receiving different sized mattresses that should be the same. Some customers had difficulty choosing the proper firmness levels, requiring swapping out of the mattress or purchasing of a topper. Some customers found the mattress was softer than expected. Some customers reported motion transfer that was unsatisfactory. Some customers found edge support to be lacking. There were no 3-star reviews for the Luxury Contour Mattress by Nest Bedding. No complaints specific to the Hybrid Latex have been left. Some customers felt they chose the wrong firmness level, but were able to swap out their orders. There were no 3-star reviews for the Organic Latex Mattress by Nest Bedding. An overwhelming majority of Nest Bedding customers love their sleep-related products. With that said, nearly every mattress company has at least a small contingency of customers who really had a bad experience. While that number is quite small for Nest Bedding, less than 1% of reviewing customers voice significant complaints coupled with a 1-2 star review on the Nest Bedding site. We’ve rounded up this small cadre of unsatisfied sleepers and present to you some of the worst experiences customers have had with Nest Bedding products. Returns of mattresses that are uncomfortable to customers before an “adjustment period” has been observed are uncommon. Some customers report more extreme offgassing in memory foam mattresses. Some customers report mattresses deteriorating rapidly. Adjustment period of 30 days can feel too long for those unable to sleep due to choosing wrong firmness level or mattress. Some customers report bad experiences with delivery personel (Fedex or UPS). One of the most unique aspects of Nest Bedding is the full range of price points their mattresses can be obtained at. With twin mattresses available in their variety of mattress materials ranging from $399 to $1,099, and queen and king-sized higher-end mattresses for going for as much as $2,199, Nest Bedding straddles price points from low to high. While the mattress itself is what is being purchased (along with additional accessories), one must look at everything else one gets from Nest Bedding in a purchase. A lifetime warranty, 100-night risk-free trial, free returns and exchanges, super responsive customer service, and 0% APR financing available are all aspects of Nest Bedding products that are also included in the price. These are all crucial to Nest Bedding products retaining their value, and to judging whether the price is “right” for a consumer. The quality of the mattresses — as exemplified by the very high percentage of rave reviews on Nest Bedding products — along with the assurance that most experiences with the brand are risk-free and lead to good outcomes, makes Nest Bedding a great choice whether you’re looking at their cheapest or most expensive options. Below we’ve listed out all pricing options as of October 2018. Are kid’s mattresses from nest bedding good values? Are memory foam mattresses from nest bedding good values? Are coil spring mattresses from nest bedding good values? Are latex mattresses from nest bedding good values? And, are Nest Bedding’s organic mattresses good values? For each, we’ll compare nest bedding products in a given category to competing brands, to ascertain if Nest Bedding lives up to all the hype, or not. We’ll start with the most popular category of online “mattress-in-a-box” purchases: memory foam mattresses. Nest Bedding offers five mattresses made with memory foam. One of these is a children’s mattress which we will address in its own section. Of the other four mattresses, price points start with the budget Love and Sleep mattress. This mattress ranges in price from $349 to $749. Of memory foam mattresses, the most expensive offered by Nest Bedding is the Hybrid Luxury Contour. This high-end memory foam mattress is priced from $1,299 to $1,749. A starting point for looking at Nest Bedding’s memory foam mattresses is to place them against peer mattresses. Generally speaking, most online mattress retailers are selling at least mid-tier price-point mattresses, and many are competing against mid and top-tier mattress makers. Sleep from the Dead has a nice write up comparing common mattress tiers. In this write-up, you can see that common prices for a low-end queen-sized mattress are around $700. Mid-tier mattresses range from above $700 to $1,800. High-end mattresses generally start at around $1,800 and can go as high as tens of thousands of dollars. With these categories in mind, we can begin to look at how Nest Bedding stacks up. The Love and Sleep memory foam mattress comes in at $599 for a queen-sized mattress, slightly lower than the average price for low-end mattresses. The mattress isn’t the most high-tech you’re going to see from Nest Bedding, but it does incorporate a few quality elements. A variety of technologies are employed to reduce overheating, a common concern in memory foam mattresses. Two firmness levels are offered, which is more than many competing brands. Additionally, even though the mattress is a third of the price of more expensive Nest Bedding products, it still comes with top notch customer service, a 100-night risk-free trial, and a lifetime warranty. One final note is that an overwhelming majority of verified customers have rated their Love and Sleep mattress 5/5 stars. While you aren’t getting many extra bells and whistles with this mattress, it’s a great value. One caveat is that the two firmness levels offered for the mattress are both on the firmer side, and some reviewers note this. If you like very soft mattresses, the Love and Sleep just may not be what you’re looking for. But for most purchasers, the verdict stands: the Love and Sleep mattress is a great value. Looking at the most expensive memory foam-based mattress offered by Nest Bedding, we see a very different proposition. The Hybrid Luxury Contour costs $1,599 for a queen-sized mattress. This places this mattress slightly below a high-end price point. As the name hybrid suggests, this mattress is composed out of a number of types of foam as well as coil spring technology. This trend in more high-end mattresses provides the feeling of a mattress being “soft and firm.” As the body sinks into the foam layers of the mattress, the underlying coil springs start to support the body. This form of the mattress provides excellent versatility and is often celebrated for a wider variety of sleepers (side, back, or stomach). What Makes Nest Bedding Mattresses Unique? While we’ve covered many of these details in previous sections, one can quickly sum up what makes Nest Bedding mattresses unique in a few points. Nest Bedding mattresses are unique due to the range of materials available, outstanding customer service, the range of possible price points, and brick and mortar presence. Below we’ll tackle each of these points in more detail. The first aspect of what makes Nest Bedding mattresses unique is their range of materials available. The three most common manufacturing methods for mattresses include foam, coil spring, and latex mattresses models. Most online mattress retailers (“mattress-in-a-box” companies) offer one of the major mattress types. Nest bedding offers foam, foam with coil spring mattresses, and natural and organic latex. Each respective mattress material is competitive with brands providing these types of bedding products. The second aspect of what makes Nest Bedding mattresses unique is their outstanding customer service. Just looking through recent reviews shows a responsive and capable customer support team. Customer support specialists are also cited explicitly in many reviews as a crucial component in satisfaction with Nest Bedding purchases. For customers who believe that they may have the wrong product, or have chosen the wrong firmness level, Nest Bedding customer representatives are responsive and help to facilitate quick exchanges (or in the case of needing a softer mattress, mattress toppers). Customer support for Nest Bedding also offers advice on what product may be a good “fit” for customers, as well as tips for how to better adjust to a new mattress. The third aspect that makes Nest Bedding mattresses unique is their range of price points. We tackle this matter in great detail in the value proposition and pricing of a Nest Bedding mattress sections above. In short, Nest Bedding offers mattresses at low-tier through high-tier price points. Traditional mattress tiers range up to $700 for a low-tier mattress, $700 – $1,800 for mid-tier mattresses, and $1,800+ for a high-tier mattress. Nest Bedding offers mattresses ranging from $599 through $1,999 for a queen. The fourth aspect that makes Nest Bedding mattresses unique is their brick and mortar presence. Unlike other “mattress-in-a-box” retailers, Nest Bedding developed. Since the founding of Nest Bedding, the company has marched to the beat of their own drum. In 2011, several years before online mattress retailers started to emerge, founder Joe Alexander conceived of a brand built around boutique brick and mortar stores. After visiting the stores, customers could choose a mattress that would be shipped to their homes in a box. As mattress e-commerce matured over the following few years, Nest Bedding pursued growth in both their brick and mortar locations as well as online. From the start, the idea of a ‘nest’ appealed to Jon Alexander. The finest locally sourced materials on which you can sleep at night. Though Nest Bedding has moved through several sourcing partnerships through the years, each of their mattresses is crafted with the utmost attention to materials right here in the USA. While this means different standards for different materials, each category of mattress offered by Nest Bedding excels within their given mattress type. For memory foam mattresses, this means Certi-Pur US Certified materials. For organic latex mattresses, this means GOLS Certified Organic Latex coated with GOTS Certified Organic Cotton, the highest of standards for organic mattress products. Nest Bedding stands behind this quality too. Lifetime quality warranties, 100-night risk-free trials, and easy exchanges for different firmness levels are lauded by thousands of happy customers across the brand’s price points. These traditionally high-end mattress “extras” are extended across Nest Bedding’s products, exemplifying their online tagline: “affordable luxury. ” While competing online mattress retailers tend to over a handful of these perks, Nest Bedding differentiates themselves through being a full-service mattress retailer no matter the price point. Nest Bedding was founded by Joe Alexander after several years of retail — and particularly bedding retail — experience. A superstar retail sales associate at Slumberworld, Joe Alexander sold $1.8 million in sleep products in one year. Following this great year of sales, Alexander worked for four years as a general manager helping to set up a store network for bed-in-a-box company Keetsa. Through his knowledge of what consumers really want in a mattress, sales, and logistics, Alexander conceived of Nest Bedding. Nest Bedding was founded as a series of boutique stores offering local material sources, and bed-in-a-box delivery of American made mattresses. The brand initially sourced products from Johnson City, TN-based BedInABox. BedInABox was a pioneering company in the (you guessed it!) bed-in-a-box space and allowed NestBedding to establish themselves as a high quality, locally sourced, American-made brand. In late 2016, Alexander merged his growing network of stores with Brooklyn Bedding. Brooklyn Bedding had recently created a new factory for the manufacturing of the highest quality mattresses. With the ability to generate more mattresses, Nest Bedding has accelerated their brick and mortar footprint moving beyond the San Fransisco Bay Area, Los Angeles, and New York. Since late 2016, Nest Bedding has expanded their showrooms to include a cluster of locations around Tempe, Arizona, a location in Chicago, a location in Denver, a location in Minneapolis, and a location in Seattle. Additional plans are to open 50-60 locations nationwide in the coming years. While Nest Bedding has continued to increase their in-person showroom presence, they’ve also expanded online. Sales online outpace in-person sales for Nest Bedding at close to 2 to 1. The offering of the same high-quality customer service available in stores, as well as the ability for customers to try out mattresses in-person in many major markets, has been central to Nest Bedding’s online success. Throughout both brick and mortar and online expansion efforts, Nest Bedding has been continuously lauded for keeping their standards high. As detailed in our section on good, bad, and ugly reviews, Nest Bedding products have overwhelmingly been reviewed positively. Many products in their line have not received reviews lower than 3 in 5. As we’ve covered throughout this review, Nest Bedding has A TON of options. Most online mattress retailers offer mattresses made of a single material as well as a small range of firmness levels. Nest Bedding offers multiple firmness levels and all traditional mattress sizes for nearly all of their seven mattress lines. Below we’ll list the sizes, dimensions and firmness levels offered for Nest Bedding mattress products. Nest Bedding offers a full line of bedding products including bases for beds, sheets, linens, and duvets, dog beds, and other miscellanies. Below we’ll examine the range of Nest Bedding products that are not mattresses. Nest Bedding offers a range of standard bed base types, with the highest end model coming in at a greatly more affordable price than competing brands and a wooden base with built-in USB charging stations. The adjustable base offered by Nest Bedding includes a remote, silent motor, and the ability to split the bed configuring different positions on either side of the mattress. Nest Bedding offers an entire range of sheets and blankets. Every mattress comes with a free set of sheets, with many customers surprised by the quality and deciding to purchase additional sheets from the brand. Below we’ve listed all of the sheet and linen-related products offered by Nest Bedding. Nest Bedding offers one of the widest range of pillow products of any online mattress retailer. At a variety of price points, almost all Nest Bedding pillows have been received overwhelmingly well according to reviews. They come in a variety of heights, different materials, and for specialty needs such as sleeping styles or those who sleep hot. Check out the range of Nest Bedding pillow products below. Besides the Big Kid’s Mattress, Nest Bedding offers some unique children-related products. These include Crayola-colored sheets coming in 24 colors, a children’s pillow, and crib mattresses. Besides linens, covers, and pillows, Nest Bedding also offers lifestyle products such as sleepwear, apparel, and even dog beds. Check out the range of additional Nest Bedding products below! To a greater degree than many competing brands, Nest Bedding offers regular discounts and incentives to “buy now” on their website. At the time of this writing, every mattress has some level of limited-time-only discount, as well as comes with a free set of Nest Bedding sheets. A rundown of all deals put on by the company itself may be found here. Additional coupons and deals may be found below. Additionally, Nest Bedding products may be purchased through middlemen such as Amazon.com. This could allow for participants in Amazon rewards programs, Prime, or credit card holders to obtain better deals. One note is that buyers on third-party sites should beware that not buying directly from Nest Bedding can invalidate the warranty, free returns policy, as well as customer service. Additionally, products are offered through third-party sellers such as Amazon.com. While there are pros to purchasing through Amazon such as Prime or Amazon-related credit cards, buyers should double check as to whether buying through a third-party invalidates a number of crucial benefits of buying through Nest Bedding.